The link is given in the end. Need: Registration number & Date of Birth. If you lost your registration number page. Please check your email ID & phone massage in order to download your admit card. Even this effort, you are not able to download your admit card, write us on our comment box. Our team would help you in order to find the way to retrieve download your Railway ALP admit card 2018. 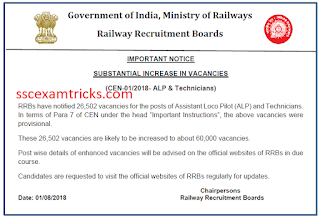 On 01.08.2018 - Notice for RRB ALP Technician Posts likely to be increased 60,000 Vacancies. 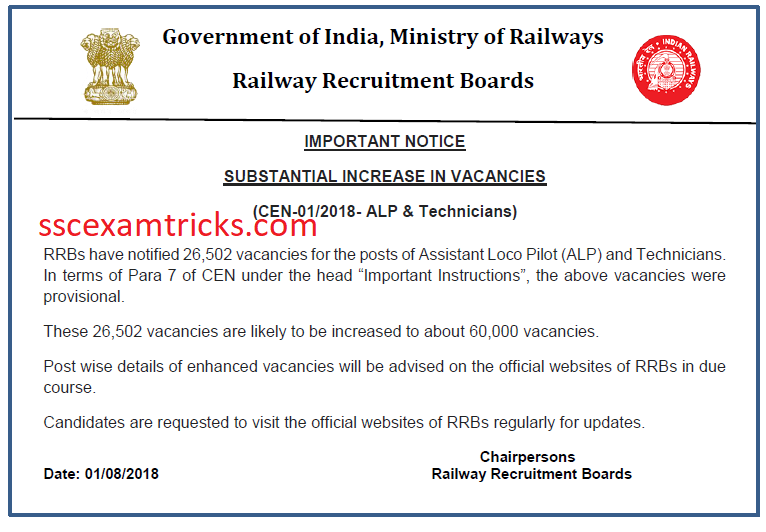 RRBs have notified 26,502 vacancies for the posts of Assistant Loco Pilot (ALP) and Technicians which have been likely to be increased to about 60,000 vacancies. 01-08-2018: CEN-01/2018 - Click here to know why are candidates getting test centres outside their states. 28-07-2018: CEN-02/2018 - Date is extended upto 30.7.2018 (23:59 hrs) to modify invalid photographs. 27-07-2018: CEN-01/2018 - Click here for HELP DESK for candidates. 26-07-2018: CEN-01/2018 - Click here for Mock practice of CBT for the candidates. 17-07-2018: CEN-01/2018 - Important Notice regarding Modification of Invalid Photographs (ALP & Technicians). 17-07-2018: CEN-02/2018 – Important Notice for candidates regarding Invalid Photographs (Level-1 Posts). Mock Test link has also been activated now. Railway Recruitment Board (RRB) is working on preparing notification for filling approximately 23801 vacancies of Assistant Loco Pilot and Technician Grade III which is expected to be available very soon on the official website at www.indianrailways.gov.in. The selection criteria includes written exam and medical examination including document verification of the candidates. The written exam will be organized as the exam date will be announced in the notification. The notification is expected to be published in the end of this year 2018. The following features/ scheme/ exam pattern of ALP Technician Grade III are discussed as under. The online admit card will be available 20-22 days before the exam date. Those candidates who are ready to attend this examination; they must download their RRB ALP Technician Admit Card 2018 from direct link given here.